Served at room temerature on a warm day or served warm on a cool day this roasted red pepper soup with grilled cheese croutons is sure to hit the spot! 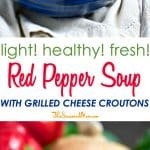 Served at room temperature on a warm day or served warm on a cool late summer evening, this Red Pepper Soup with Grilled Cheese Croutons is an easy and healthy vegetarian lunch or dinner option for every season! Tomatoes seem to get all of the love at this time of year (and I certainly appreciate a good Gazpacho), but we can’t forget about the sweet, crisp bell peppers either! Unlike the strong garlic and spice in a chilled gazpacho; this particular soup is mild and creamy — making it appealing to just about everyone. It gets a rich, deep flavor from the roasted red peppers, which is perfectly accented by the crusty, sharp, cheesy croutons bobbing on top! 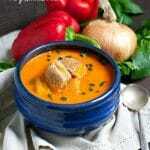 Is Red Pepper Soup Healthy? Yes! It’s like a grown-up twist on the classic tomato soup + grilled cheese combo…in a very nutritious, fresh, and delicious kind of way! Best of all, this satisfying and filling meal only requires a handful of simple (REAL FOOD) ingredients and about 15 minutes of hands-on time. The soup itself keeps really well in the refrigerator or freezer, so feel free to prep ahead and enjoy it when the mood strikes! For less than 250 calories, you can have your filling soup, your comforting grilled cheese sandwich, and a very full belly! 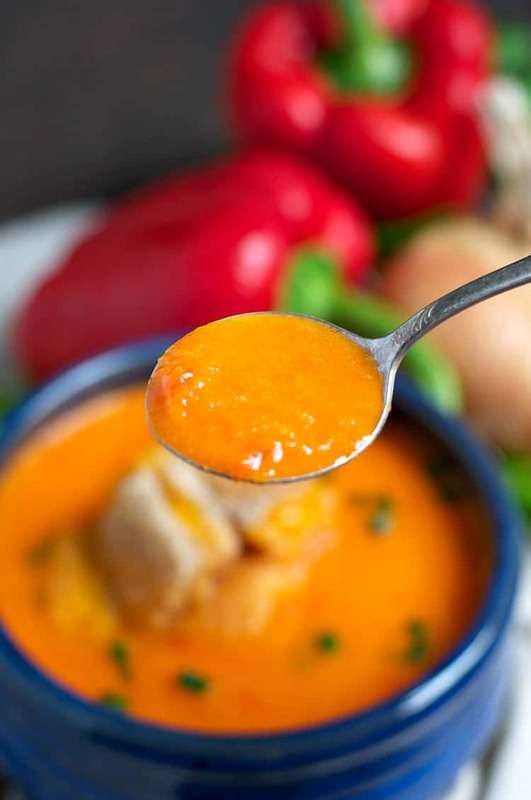 Give your red pepper soup a spicy kick by adding in some fresh chili, red pepper flakes or even some paprika or cayenne pepper. It’s easy to adjust the spiciness to your liking, for a big punch of heat go for the fresh chili but for something more subtle just add a pinch of one of the spices above. 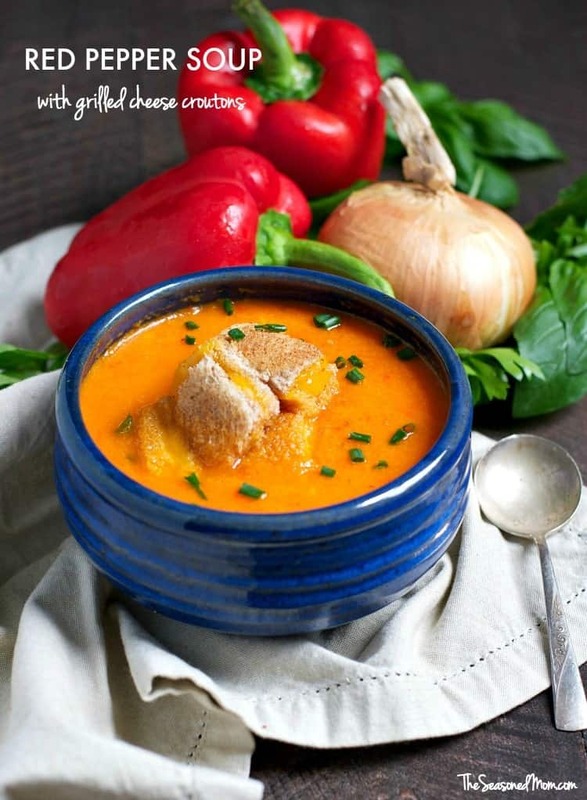 If you have tomatoes that need using up then you can add them to this soup. Why not try roasting them with the peppers? Add chili or spices to turn up the heat. You can use any good melting cheese for the croutons. This soup stores well in the fridge and can be frozen. Roast 2 of the whole peppers under a broiler or directly over a gas flame, rotating the peppers with tongs until completely blackened. Place them in a paper bag or wrap in paper towels to sweat for 5-10 minutes so that the peel is easy to remove. Rub off the skin from the roasted peppers and remove the seeds. Slice and set aside. Seed, core, and thinly slice the remaining red pepper. Melt butter in a large saucepan. Saute the unroasted red pepper, onion, and garlic over low heat just until tender (about 10 minutes). Add carrots and chicken stock. Bring to a boil, lower heat, and simmer until carrots are very tender (about 30-40 minutes). 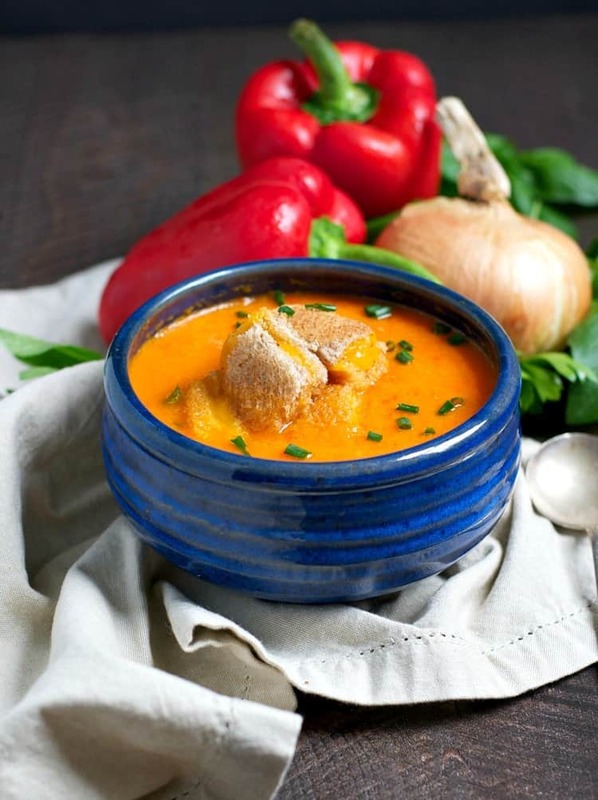 Allow the soup to cool slightly before adding the roasted red peppers. Puree the mixture in a blender or food processor until smooth. Taste and season with salt and pepper, as needed. This soup is delicious served warm (just return to the saucepan and reheat if desired), or you can serve it at room temperature on a hot day! Line a baking sheet with foil and spray liberally with cooking spray. Divide cheese evenly among two slices of bread. Place on prepared baking sheet and top with remaining bread to form 2 sandwiches. This is such a pretty soup, Blair! I love that you can serve it at room temperature, if needed. I’ve never had red pepper soup before, but I have no doubt that I would love it. Sounds perfect for the grilled cheese croutons, too! Hoooooolyyyyy Heck YES YUM! This is just scrumptious looking! I used to LOVEEEEEEEE Grilled Cheese with ketchup, so I am pretty sure I would adore this! Thanks so much, GiGi! It’s like the grown up version of your childhood fave! Oh, this is the perfect soup, Blair, and I have all the ingredients in my fridge! What a wonderful way to use up my leftover peppers and carrots. Your photos are SO pretty! I’m in love with the little grilled cheese croutons! Grilled cheese croutons?!?!? Now THAT sounds like a delicious idea! I don’t even like croutons but they sound incredible! Oh, trust me…you’d like these croutons Kristy! 🙂 Thanks so much! Thanks, Megan! I get the same way — sometimes I just want soup…even if it’s a cold one in the middle of the summer!